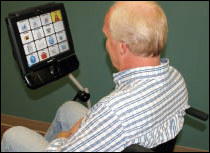 The Augmentative Communication and Assistive Technology Program serves all People living with ALS in the Oregon and SW Washington areas, at no cost. Founded in 2002, our goal is to support communication and access needs for all People living with ALS by providing education, services, equipment, and advocacy. Many People living with ALS experience speech or voice changes that affect their ability to communicate with others. Augmentative Communication options include anything that can be used to supplement or replace speech in order to effectively communicate. Examples might include personal amplifiers, alphabet boards, iPads, or Speech Generating Devices. CLICK HERE for information sheets and web resources related to AAC. Assistive technology refers to tools that can offer support, modification, or assistance to People living with ALS. The goal is to support abilities and quality of life. While most equipment improves accessibility, other items or systems might be more personalized to meet individual needs. Popular assistive technology items include low-tech call systems, adaptive telephones, text-to-speech and speech recognition software, and switch-adapted appliances. The chapter maintains a loan closet with a selection of augmentative communication and assistive technology equipment available to all People living with ALS in our region, free of charge. This equipment is a popular resource for the community and is maintained through donated equipment by members of the community. Donations of equipment items are appreciated, please call to inquire about accepted items. Examples include:-Personal amplifiers, laptop computers (Windows 7 or later, please), iPads (any generation), switches, digital recorders, Bluetooth speakers. **Note: If you are interested in donating wheelchairs and other DME to our Chapter DME Loan Closet, please call our main office line at (503) 238-5559 ext 100 or (800) 681-9851 ext 100. For more information about the Augmentative Communication and Assistive Technology Program, please contact our Assistive Technology Services Coordinator at (503) 238-5559 ext 104 or email AAC@alsa-or.org.